Experience the “inside” of my commitment to embodiment. Take movement inward to find out the TRUTH that only your body knows. Your body doesn’t lie…rediscover a precious friend and confidant through Belly Intelligence. This is an experience that will change the way you relate to yourself, leading you back to trusting the INNATE intelligence of your body. It is a journey into YOUR truth, which most of us turned away from YEARS ago. No dance experience required. It’s great to experience this with someone you’re close to, as you can continue the practices together. 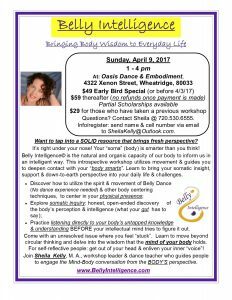 Sunday, April 9, 2017, 1 – 4 pm @ Oasis Dance & Embodiment, 4322 Xenon Street, Wheatridge, 80033. Sheikha’s students & their friends get $10 off! Partial Scholarships available. Want to tap into a SOLID resource that brings fresh perspective? It’s right under your nose! Your “soma” (body) is smarter than you think! 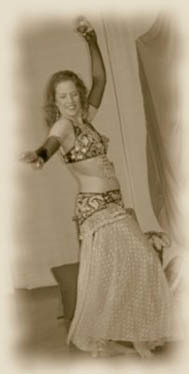 Belly Intelligence© is the natural and organic capacity of our body to inform us in an intelligent way. This introspective workshop utilizes movement & guides you to deepen contact with your “body smarts”. Learn to bring your somatic insight, support & down-to-earth perspective into your daily life & challenges. Practice listening directly to your body’s untapped knowledge & understanding BEFORE your intellectual mind tries to figure it out. Come with an unresolved issue where you feel “stuck”. Learn to move beyond circular thinking and delve into the wisdom that the mind of your body holds. For self-reflective people: get out of your head & enliven your inner “voice”!